The Life of Fr. Gene Wilson, C.PP.S. Fr. Gene R. Wilson, C.PP.S., 88, died of heart failure at 7:45 a.m. on Thursday, March 30, 2017 at Firelands Regional Medical Center in Sandusky, Ohio. He was born on May 18, 1928, in Charleston, W.Va., to Luther Lee and Hilda (Lawson) Wilson. The family later moved to Cleveland, where he was raised. He entered the Missionaries of the Precious Blood in 1950. 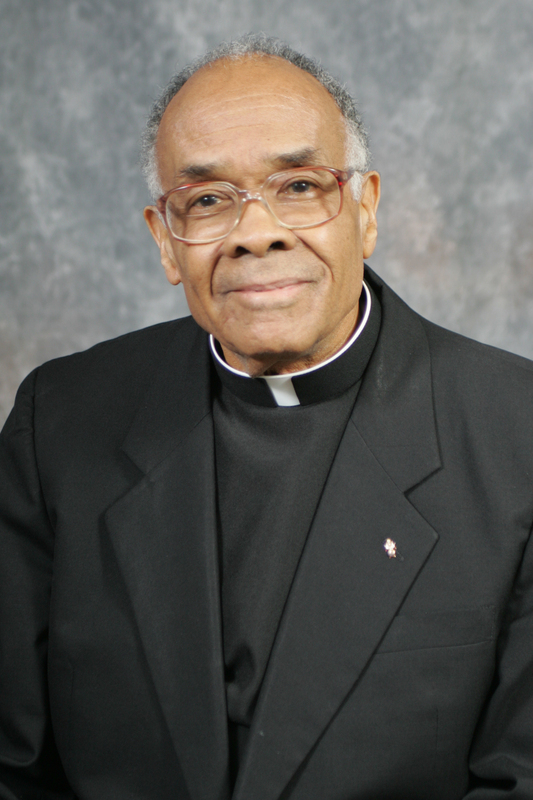 He earned a bachelor’s degree from Saint Joseph’s College in Rensselaer, Ind., and was ordained on May 28, 1960. After two years of parish ministry at St. Adalbert Church in Cleveland, Fr. Wilson attended Catholic University in Washington, D.C., where he studied library science. A lifelong learner, Fr. Wilson later completed coursework at other institutions as well. In 1964, he was named librarian of Brunnerdale, the congregation’s high school seminary near Canton, Ohio. He later returned to parish ministry, once again at St. Adalbert where he served for many years, and at St. Anthony Church in Detroit; St. Francis of Assisi in Palo Alto, Calif.; St. Agnes in Los Angeles; St. Barnabas in Alameda, Calif.; and St. Edward Church, Newark, Calif. Fr. Wilson was also a formation team member for the Province of the Pacific. In 2006, he returned to Ohio as a senior associate pastor of St. Mark Church in Cincinnati. Since 2009, he had been in ministry at the Sorrowful Mother Shrine in Bellevue, Ohio, which is sponsored by the Missionaries of the Precious Blood. Fr. Wilson was the last of his immediate family. He was preceded in death by his parents and five siblings, Maude Harmon, Luther D. Wilson, Joan Glover, Sam C. Wilson and Verona Wilson. Fr. Wilson is survived by his sisters-in-law, Alice Wilson of Cleveland and Clara Pryor of Dallas; 10 nieces and one nephew; 11 great-nieces and five great-nephews; three great-great-nieces and three great-great-nephews; and a host of cousins and friends. At the time, Fr. Wilson was the only African-American priest in the Diocese of Cleveland. “Everybody knew him,” Fr. Williams said, adding that Fr. Wilson was very supportive of him when he began his own studies for the priesthood. Fr. Wilson had a strong devotion to the Holy Spirit and was active in the charismatic movement of the Church, often presiding at healing Masses where many people came to worship with him. Viewing was held at St. Charles on Sunday, April 2, from 1-5 and 7-9 p.m. with a prayer service at 7 p.m.
A funeral Mass was celebrated at St. Charles Center, Carthagena, Ohio, at 2 p.m. on Monday, April 3, with Fr. Larry Hemmelgarn, C.PP.S., the provincial director, presiding and Fr. Clarence Williams as homilist. On Tuesday, April 4, a wake was held from 10-11 a.m. at Holy Spirit Catholic Church, 4335 E 131st St, Garfield Heights, Ohio, 44105. A Mass of Christian Burial was celebrated at 11 a.m. at the church, with Fr. Williams as presider and homilist. Burial followed in Calvary Cemetery, Cleveland. A Memorial Mass was celebrated on Thursday, April 6 at 7 p.m. at the Sorrowful Mother Shrine, Bellevue, Ohio. Memorial donations may be made to the Missionaries of the Precious Blood, Cincinnati Province.